A municipality geared towards seaside tourism, tiny Bombinhas makes up for its diminutive size with ample opportunities off its shores, including snorkeling, diving, and boat tours. You'll visit kid-friendly attractions like Beto Carrero World and Mariscal Beach. You'll find plenty of places to visit near Bombinhas: Balneario Camboriu (Praia das Laranjeiras, Central Beach, & more). There's still lots to do: stroll through Bombinhas Beach, don't miss a visit to Vista Panoramica, stop by Mbarete Beer House & Conveniencia, and kick back and relax at Sepultura Beach. To see ratings, other places to visit, reviews, and more tourist information, you can read our Bombinhas vacation site . Sao Paulo to Bombinhas is an approximately 3.5-hour combination of flight and taxi. You can also do a combination of bus, flight, and taxi; or drive. In December in Bombinhas, expect temperatures between 32°C during the day and 24°C at night. Wrap up your sightseeing on the 14th (Sat) to allow time to drive to Garopaba. Once a sleepy fishing village, Garopaba has managed to retain much of its low-key charm despite the thousands of visitors who flock to its shores. Kids will appreciate attractions like Ferrugem Beach and Garopaba Beach. The adventure continues: stroll through Siriu Beach, enjoy the sand and surf at Barra Beach, make a trip to A Nave, and take in the architecture and atmosphere at Paróquia São Joaquim. To see reviews, where to stay, ratings, and tourist information, refer to the Garopaba trip planner. Traveling by car from Bombinhas to Garopaba takes 2 hours. Alternatively, you can take a bus. In December, plan for daily highs up to 32°C, and evening lows to 24°C. Finish up your sightseeing early on the 17th (Tue) so you can go by car to Florianopolis. Divided between island and mainland, the distinctive city of Florianopolis charms visitors on first arrival with its impressive skyline. Family-friendly places like Praia Mole and Jurere Internacional will thrill your kids. 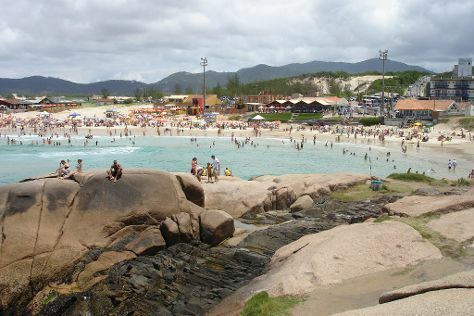 Step out of Florianopolis with an excursion to Praia do Rosa in Praia do Rosa--about 1h 40 min away. There's much more to do: kick back and relax at Joaquina Beach, appreciate the extensive heritage of Santo Antonio de Lisboa, make a trip to Ciclovia Beira Mar Norte, and tour the pleasant surroundings at Lagoinha do Leste. To find photos, reviews, maps, and other tourist information, read Florianopolis trip itinerary planning app . You can drive from Garopaba to Florianopolis in 1.5 hours. Alternatively, you can take a bus. Expect a daytime high around 32°C in December, and nighttime lows around 24°C. Finish your sightseeing early on the 23rd (Mon) to allow enough time to travel back home.